In my home there’s an old tattered King James Version of the Bible given to me by my aunt on the occasion of my graduation from high school. While leafing through it several years ago, I came across a long forgotten section called the Names and Titles of Christ. It was early Autumn, so in anticipation of preparing our own calligraphic Christmas card, I decided to incorporate these names and titles into a Christmas tree. After talking it over with my trusted Art Director (wife Jean), we went to work designing the tree. At first glance it looked simple. However, it was complex to arrange names of varying lengths to form the proper shape. We also had to consider appropriate contrasting red decorations and finally something for the tree to sit upon. The result was a beautiful, meaningful Christmas card. The original was lettered on Arches 140# white hot press cotton rag paper using our favorite gouache paints by Windsor Newton. Fortuitously we had just completed it when the Director of a choral group, The Singing Christmas Tree, called to inquire about having a Christmas-themed print made for each of their 300 members. When the choral master visited our studio, he was amazed to see our just-completed tree and quickly chose it to gift each of their singers and staff. The prints were made, matted in red, and placed in individual acrylic sleeves just in time for their performance. As always, when we make prints for customers, we make extras to sell to others. Those reading this article are in luck, because we continue to make new prints of our Names of Jesus Christmas Tree every year. 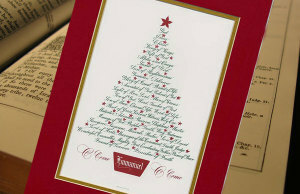 View all the names that make up the tree, read the sentiment inside, and learn how to order a box of cards from my daughter Holly’s website- or see all my works – and place your order early! 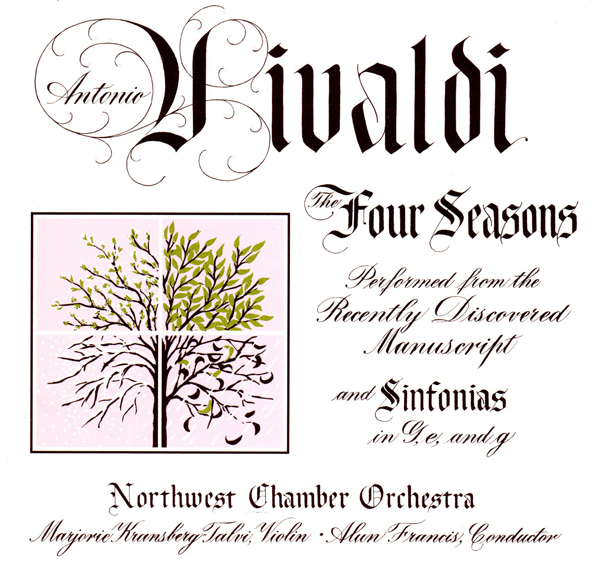 Christmas – one of Vivaldi’s 4 Seasons? The Christmas season has a way of bringing back memories — and I have quite a bit of past from which to draw! Lately, I’ve been thinking about one of Heirloom Artists’ best Christmas card customers — Bill Hollingsworth and his wife Kay of Issaquah, Washington. Bill was a minister and my wife Jean’s brother; Kay was a concert violinist. They had friends spread all over the country and overseas, so every year the Hollingsworth’s bought large quantities of Christmas cards from us. In turn, we gave them several original pieces of calligraphy as gifts. 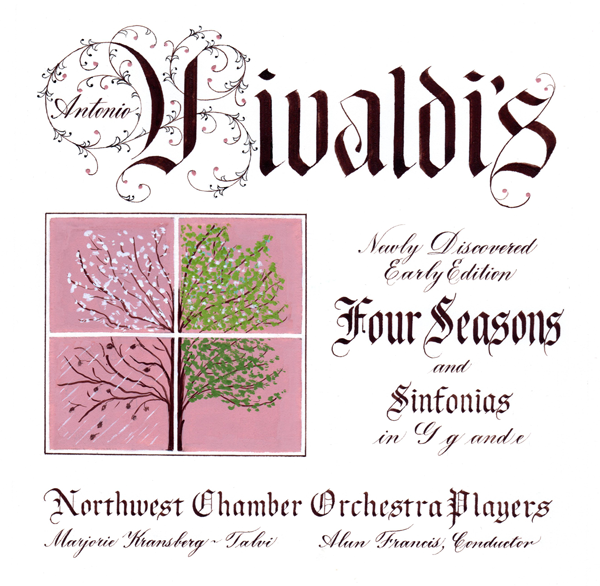 A number of a years ago, when Kay was playing with the Northwest Chamber Orchestra Players in Seattle, the orchestra elected to add Vivaldi’s “Four Seasons” to their program. Kay asked if we were interested in designing the CD jacket for the audio recording. We were. Jean, Heirloom Artists’ Art Director an artist in her own right, jumped in with her usual enthusiasm by sketching what four seasons might look like through a window. The text, of course, would be pure calligraphy. I might mention here that Jean and I met because of our mutual interest in classical music. We did several renditions for the orchestra’s art director, and they made the final selection. As is often the case with artists and their artwork, we preferred our original, more colorful, concept to their more subtle rendition, and the final printing lacked the color punch we envisioned. However we enjoyed doing the project and are pleased to have a copy of the CD made from those performances.